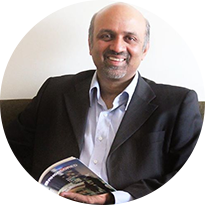 Sanjay Koppikar is a serial-entrepreneur, a published author, and a motivational speaker. As an Entrepreneur starting his journey at an age of 18, he has built and run various IT & Software companies since 1988 catering to various small and large companies / enterprises / banks across the different geographies. He is Director and CEO of Quadwave Consulting Pvt Ltd, a Bangalore based Software Solutions company focused on rendering BPM Consulting, Product and application services with direct presence in USA, UK and India and through partners in other geographies. Specialties: Sanjay Koppikar is an expert in Business Process Management & Workflow, CEP & BigData based systems and solutions with large experience of participating, designing, developing and managing whole-life-cycle of various International products, large implementations and consulting. Sanjay Koppikar has specialties in designing and developing business and technology strategies, technology innovation, software product ideation, software product management and large project management. Through various forums, he helps many start ups through mentoring programmes & incubators. Sanjay is also a TEDx speaker.